Have you ever had to choose something (a new computer, kitchen cabinets, eyeglasses) and had so many choices that you became overwhelmed and got analysis paralysis? You might feel that way when looking at our Solder Alloy Directory which has over 220 alloys. So many choices! What is the service temperature of the final product? What is the maximum processing temperature of any components that you are soldering? If you would like one of these posters (8.5" x 11") send me an email at cgowans@indium.com. 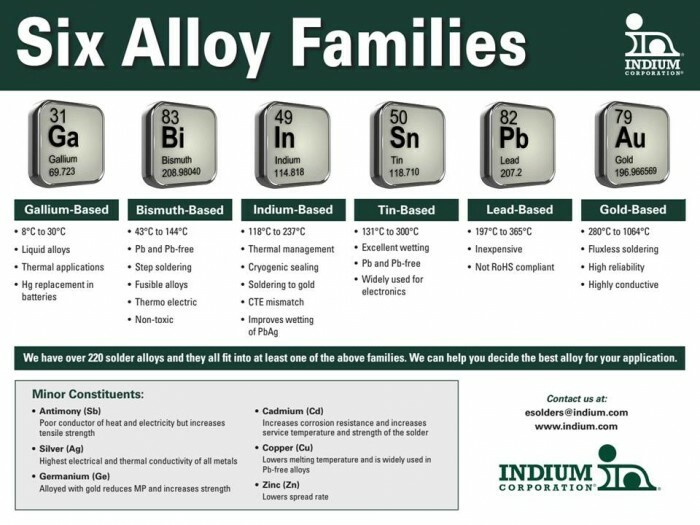 You can also start your journey to choosing the right solder by determining the alloys available in your temperature range by going to our web site at http://www.indium.com/solder-alloy-guide/.